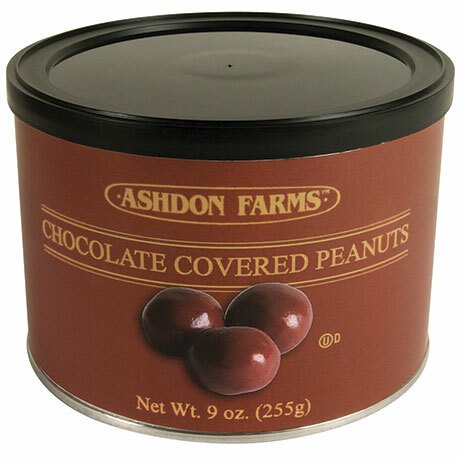 Freshly roasted and lightly salted peanuts double-dipped in silky smooth chocolate. Pull-top can with resealable lid. 9 ounces. Please note: Shipping may be delayed until temperatures drop below 80 degrees. Peanuts, sugar, hydrogenated palm kernel oil, milk chocolate (sugar, cocoa butter, chocolate, whole milk powder, soy lecithin, salt, vanilla), cocoa powder, whey powder, nonfat milk powder, corn oil, soy lecithin, vanilla, gum arabic, corn syrup lac-resin.